The New School will be holding its 76th commencement ceremony on Friday, May 18, 2012. This year they would like students to be part of the making of the commencement program. The program will be 12in x 9in flat and 6in x 9in folded, and printed in full color (4C process), and one or more designs will be chosen to be printed on its cover. Deadline for submission is Monday, April 16. 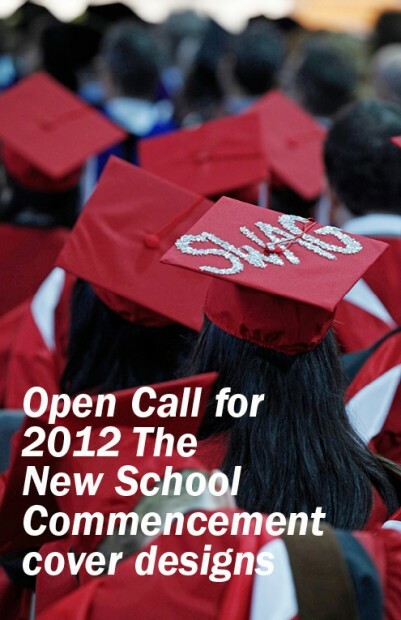 Students interested in creating a cover should contact Ed Pusz, the art director of the Communications and External Affairs Design Studio at The New School, at pusze@newschool.edu subject line “commencement”, for copy requirements, identity materials and more information.